Something that’s clear to anyone who has had a garden, or even has met a gardener, is that weeds are generally despised. They compete with our crops for nutrients and water; they shade our plants and stunt their growth; they make the place look unsightly. Now, the most effective strategies for keeping the thistle (and buttercup, and lambsquarter, and pigweed, and shepherd’s purse, etc) population in check don’t actually involve tractor mounted cultivators, per se: fallowing a whole field and stale bed cultivation. The easiest way to deal with weeds is when you can take a mower or a disk to an entire field that doesn’t have any crops growing in it. One acre left fallow adjacent to an acre being planted. 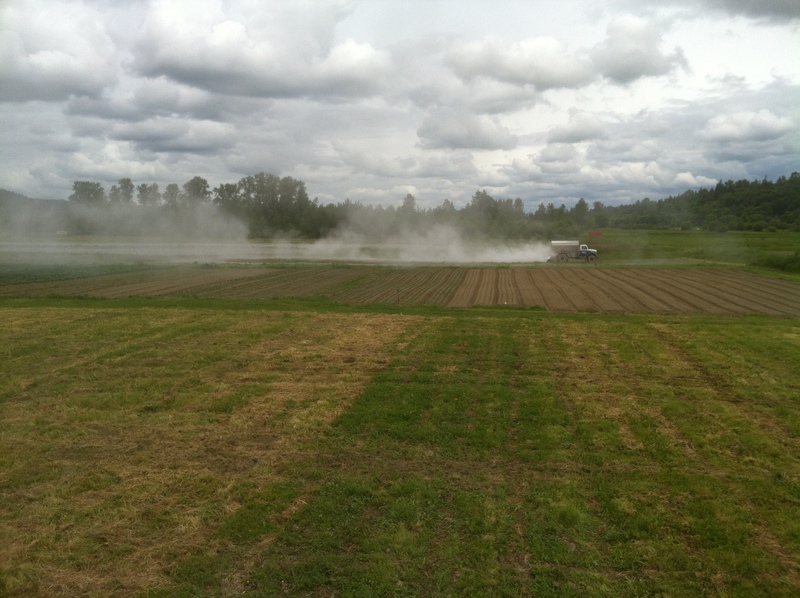 The truck in the background is spreading lime, to raise the pH of the soil – we spread 4400 lbs per acre! For fields that we do intend to plant into, to the greatest extent possible, we try to use stale bed cultivation to control weeds. Whenever you work up soil, getting it ready to plant into, you are also creating a very hospitable environment for weeds. Weather permitting, we try to have a field we are planting into spaded three weeks to a month prior to planting. In that time, weeds will have germinated and started to grow. Right before planting, we make beds with our tiller, which does in most of the weeds that had appeared since the field was spaded. Of course, in the lovely Pacific Northwest, the weather rarely is permitting. And for a good portion of our season, dry weather windows that allow us to work the ground are few. So, we frequently spade and till the same day or week, and we don’t get the opportunity to do that sort of stale bed cultivation. Now, it sometimes happens that beds get tilled and marked, but nothing gets immediately transplanted into them. By the time we are ready to transplant into one of these forgotten beds, if it has been colonized by weeds it gets a second tilling. One observation we’ve made, is that these beds are almost always the most weed free beds on the farm. For now, maintaining good soil structure is a higher priority than killing weeds, so we won’t be double tilling all our beds any time soon. But as with everything, there are always tradeoffs to be made and other possibilities to consider. 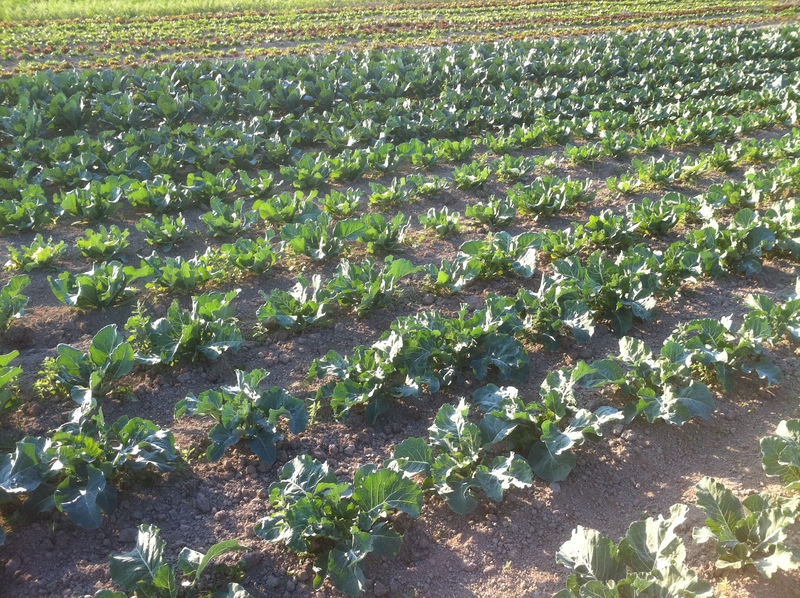 Our fall broccoli field – cover cropped, stale bedded, spaded, tilled, and ready for transplants this week! Once crops are in the ground, it’s much harder to kill weeds because you don’t want to accidentally kill your veggies too. 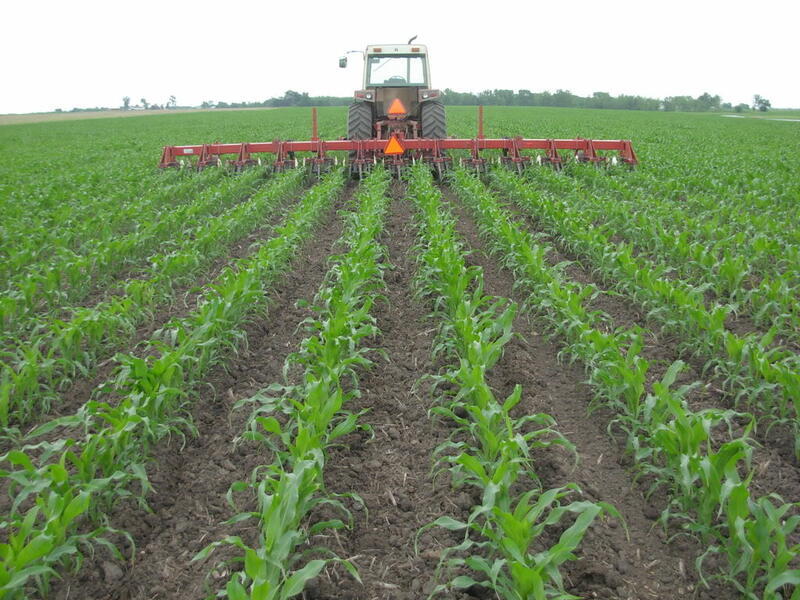 Larger, modern farms use herbicide and GPS guided tractors with 30′-wide cultivators. But back before all that, commercial farmers used tractors with special weed-killing implements mounted in front of the driver to kill weeds. They stopped making these types of tractors in the early ’80s, but small-scale farms like ours still use them because they are the right scale for our sized farms. 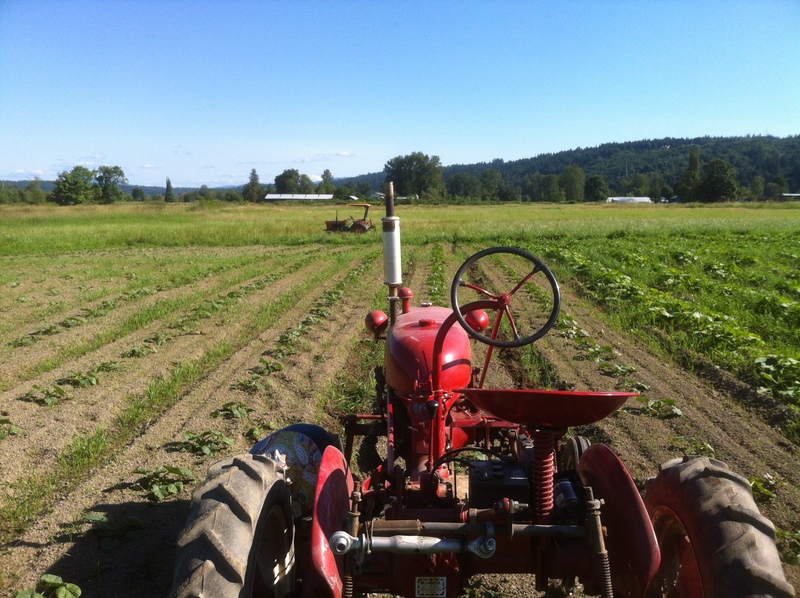 On our farm we have a Farmall Cub from 1951 and a Kubota 245H from 1984 that we use for cultivation. Basically, sweeps are sharpened shovel blades mounted on the end of an adjustable shank. They throw soil in both directions. Knives are sharpened unidirectional wings on the end of a shank. They throw soil in one direction (mostly). The sweeps are really nice to use because they don’t require so much precision. The shovels run down the middle between rows and are a good ways away from the plants, cutting a 6″ swath and throwing soil another few inches, depending on how deep in the soil you set them. You can go pretty quickly and not worry so much about killing your plants. They seem to work well with bigger weeds and grasses, but they aren’t especially accurate because they are fairly far from the crop. Because they throw soil, sweeps seem best suited to bigger plants that can stand having soil tossed on them, like transplanted brassicas, leeks and onions, corn, etc. Knives (or beet knives as they are sometimes called) only throw soil in one direction and only cut in one direction, so you can cultivate very close to your plants. Knives are best suited to plants you don’t want to bury such as lettuce, carrots, and beets when they are small. In my limited experience, knives work really well when weeds are small and the soil is dry enough to flow around the blades. As soon as the soil is clumpy or weeds are big enough to get hung up on the blade, the knives start pushing soil onto the crop you are trying to cultivate and they don’t work nearly as well. It has also been my experience that getting the depth set just right really improves the outcome. On our farm, are fields are generally flat, but with many undulations and rolls. Our bedshaper does a pretty good job squaring up our beds, but it’s really obvious when one isn’t level when I’m trying to use the knives because it’s impossible to adjust the height of the knives accurately across the bed. The act of tractor cultivation itself can be a bit like a crazy video game. Especially when you are using the knives, the plants, spaced every 8″ or 12″, seem to be flying by at a million miles an hour. If you could take your eyes off what you are doing for a second, you’d see that you are crawling up the bed at less than 1 mile per hour. It’s fun, and a bit stressful, especially because the third row isn’t visible from the driver’s seat. This is why it’s so important to have the rows in each bed be parallel with each other. As long as the knives that you can see aren’t killing the rows of carrots you can see, you can be pretty sure the knives you can’t see aren’t killing the carrots you can’t see. Nevertheless, I tend to stop every so often and check to make sure. 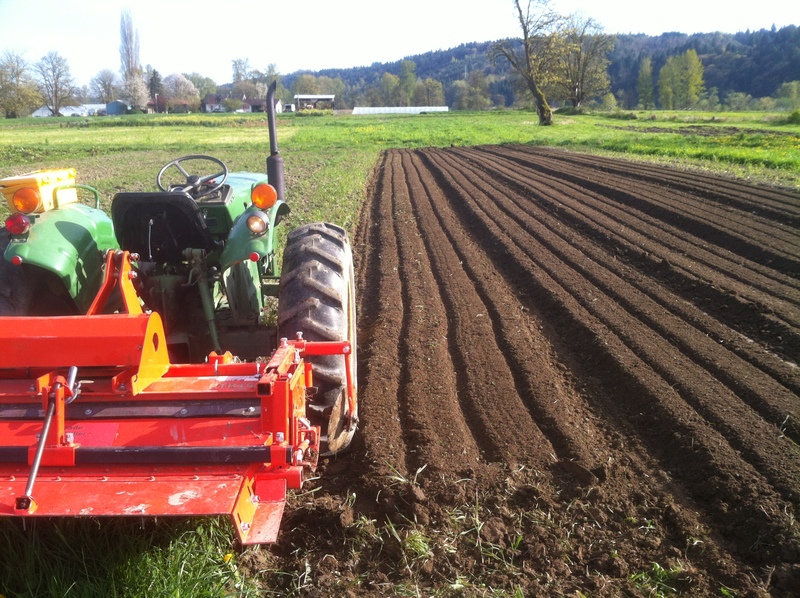 One last thought about these cultivation techniques – we invested in the Kubota this past winter for two reasons. 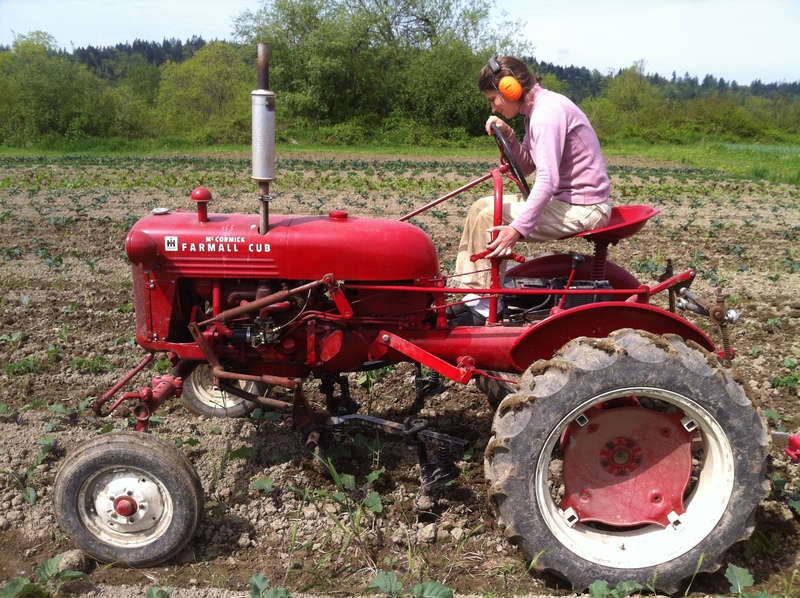 One reason was that I was the only person on the farm who could reliably get the Cub started, so it was difficult to have anyone else do any cultivation (side note – the Kubota starts up every time, and after some wintertime maintenance, so does the Cub). The other reason is that the Kubota is built to use modern cultivation tools that you can buy at your local tractor store. 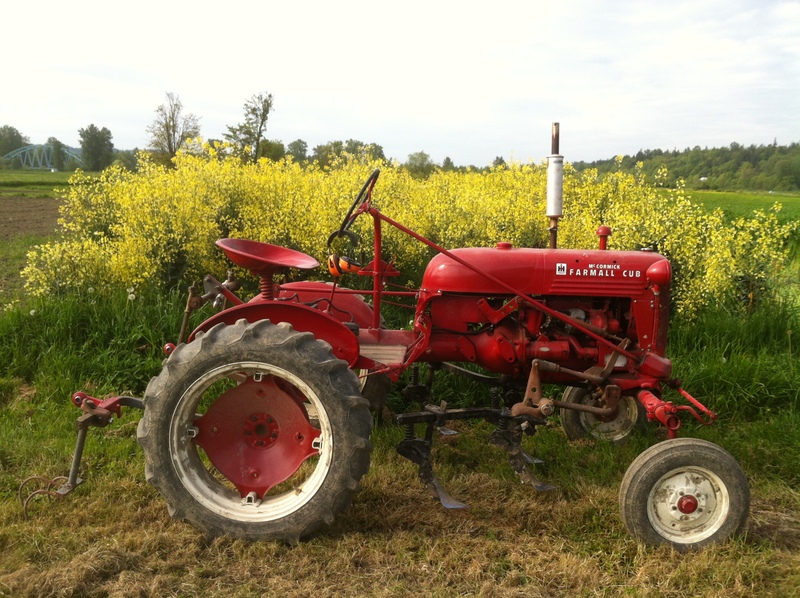 Finding an inexpensive Farmall Cub or Super A is easy. They were some of the most popular tractors ever made. However, the Cub uses what’s essentially a proprietary system that was discontinued sometime in the 1960s. 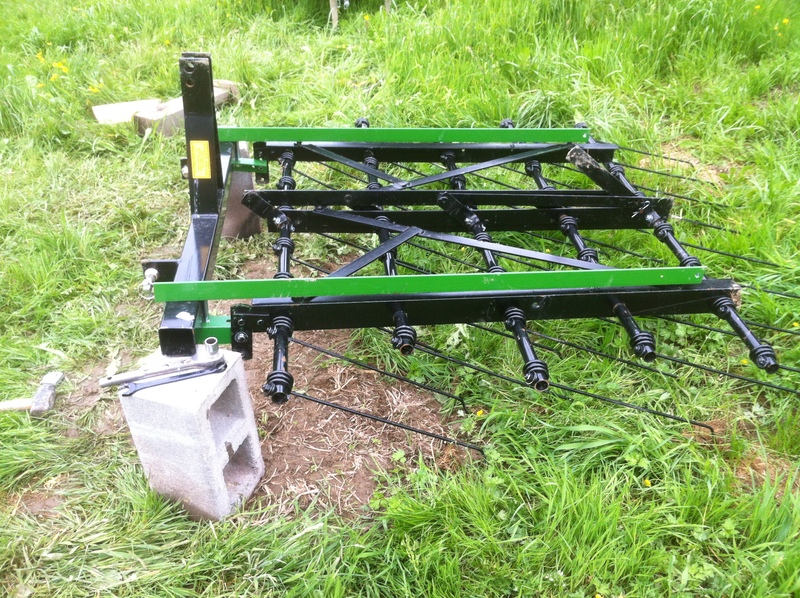 Finding cultivator parts for the Cub is an exercise in ebay frustration…. do you know how much it costs to ship hundreds of pounds of steel across the country? More than the parts costs. It is possible to have a local welder adapt the Cub’s toolbar to take the standard sized modern shanks and clamps, but that’s pretty expensive too. Sweeps and knives can be purchased relatively inexpensively from a tractor dealer. Farmall cultivators can be found on ebay, craig’s list, etc. But as far as I can tell, they never made knives. Whether knives are worth investing in, I can’t say. But I like having them because I like having options when it comes to killing weeds. Some crops like one cultivator over another, as do some soil conditions. On that note, we also invested in a tine weeder this year. We still haven’t used it much, but as our big fall plantings of beets, carrots, brassicas, and radicchio all go in this month, I think we’ll start “tickle weeding” all the beds pretty soon. The tine weeder, they say, works best when the weeds are at their “white thread” stage, meaning their root is just one thread-like radicle. 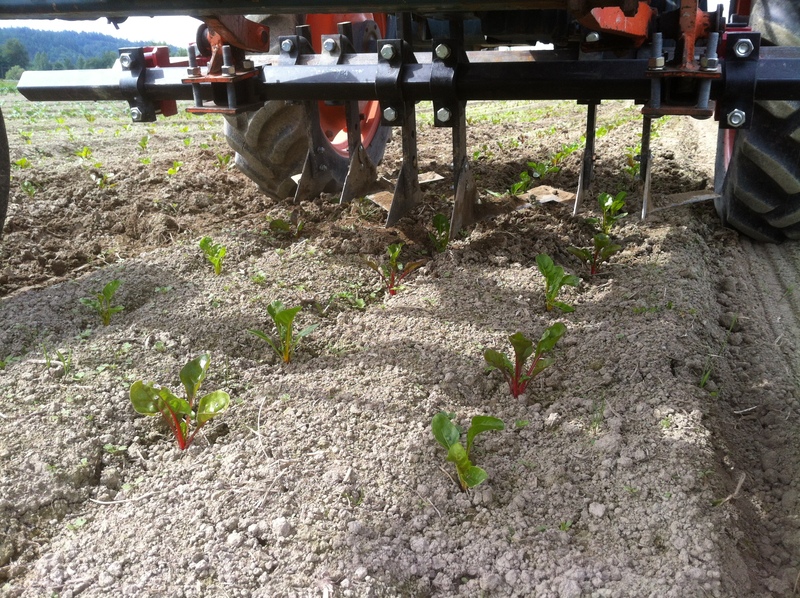 The tine weeder agitates the soil, gently hitting your crops too, but the agitation is rough enough to uproot the baby weeds. One reason I bought the tine weeder, is that it’s an aspirational tool, meaning we’ll really have our act together when we can get at every bed with the tine weeder at just the right stage…. This aspect of the tine weeder is also the reason we haven’t used it much. But it’s something to aspire to. I have never seen a cub 144 do three row cultivation before. How is it working out for you? Do you find you have to make a lot of adjustments when switching crops–say cabbage to potato? Also when we use knives we put the knife ends closest to the crop (shank part farther away), so that you only getting that horizontal undercutting action near the crop. Maybe that could help with your knives throwing too much. 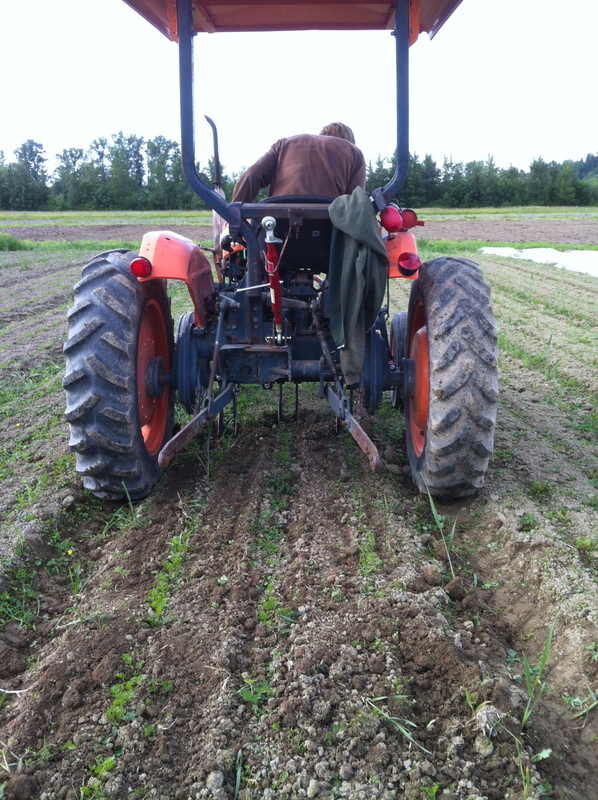 Using the standard one-row cultivation set up for three rows works great…. or, well enough. Our three-row beds have rows on 14″ centers. I just make sure the sweeps are centered between my rows. Nice piece on tractor cultivation, thank you. We have an Allis Chalmers G that we are planning to incorporate into cultivation. Q: Love the Kubota offset tractor. We did you find it? They are like gold here on the East Coast. Would very much like to add one to our farm. Nice write-up on tractor cultivation. Seems like a lost art for many small veggie farms. We have a A/C G that we are trying to incorporate into our systems. Q: how did you locate the offset Kubota? We would love to have one but there are rare here on the east coast. Also, we use a lot (too much) plastic mulch for weed control. I’m just wondering if tractor cultivation could replace it. We have a ton of weed pressure during our lovely hot, humid summers. I found the 245h on the internet. Bought it sight unseen and had it shipped here. They are out there. Can cultivation replace plastic mulch? Funny you should ask. We are considering starting to use biodegradable mulch for some crops because springtime cultivation is so ineffective…. 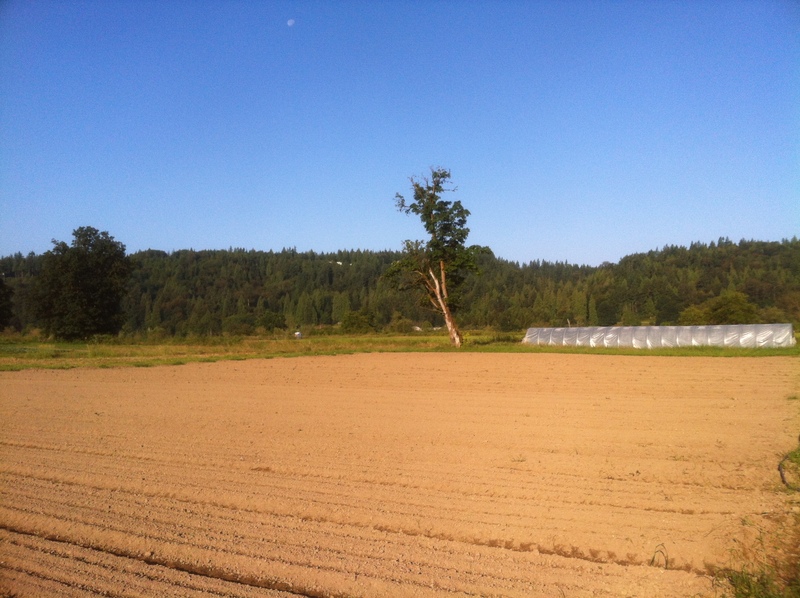 For our summer crops, it’s really dry here, so we are able to keep things pretty clean. Thanks for the reply. I would like to use biodegrable mulch but it’s currently not approved for organic production. Since we’re certified OG, that leaves, plastic mulch or cultivation. I’m learning cultivation if timed correctly can be effective but also wondering if you’re seeing issues with moisture retention and soil erosion with the rains do come with bare ground growing. I can say for sure, plastic mulch helps with moisture management (using drip tape), weed control and I’ve seen no ill effects regarding air-soil exchange. How are you irrigating, a water reel or mounted gun? Thank you! Great post. Thanks for the info. Would you be able to share the brand of that tine weeder and the distributor you bought it from? Thanks! It wasn’t that expensive…. except we never use it. So in that sense, it was…. Did you get to use your tine weeder this year? If so what did you think of it? We did not use our tine weeder. It feels too aggressive for cultivating when plants are in the ground. Sorry I can’t offer more info…. Hey Local Roots! Jess and I are having such a blast following you on Instagram. We feel like we have learned so much from you just by looking at the pictures and following the conversations. I just read through this blog post and I was wondering if you could tell me where you bought your cultivating knives from? I have be scouring the internet looking for something similar to what you have but so far I’ve come up short. any info would be awesome! Take you guys and good luck this season! Hi Brian, thanks! You should come up for a visit some time. As for the beet knives, they sell them at Farmers Equipment in Burlington WA. There’s literally a shelf full of cultivating tools. It’s awesome. oh man, that would be a lot of fun to pick through! Thanks for the quick reply and the next time we head in that direction we will definitely let you know. Same goes for you all, if you’re ever in our neck of the woods give us a holler! We’d love to have you. We’ve taken the opportunity to meet a few of the folks that we follow on social media this year and it has been really amazing to share and brainstorm with them. It’s a pretty wild age we live in. Thanks again for sharing your experiences on your blog and keep up the great work!